Part one in the series of posts on healthcare reform outlined many reasons for the need for serious change in the way America cares for the health of its people. Part two will review and critique some of the reasons reform is being so vigorously opposed. Given the obvious need to fix a system that is broken, why would anyone stand in the way? There seem to be three groups of opposition to reform. The first is based on an ideology; people who agree change is needed, but feel their methods are better than those being proposed to improve the system. The second group seems to be people who either believe we have a great system that doesn't need changed or that any change will result in significant damage to the care we all receive. And the third are those who profit greatly from the current system. To be sure, all three feed off of each other, some may subscribe to the philosophies of more than one group, and all are using underhanded methods to accomplish their goals. The idealists are those who think the free market is the best way to solve most problems, including healthcare. They often believe government involvement in anything tends to ruin it, and therefore they would like to keep the government out of healthcare. Although they don't often advertise how strongly they feel about this, many of the people in this group would like also like to abolish most social welfare programs, including Social Security and Medicare. The most recent attempt to do this was in 2005, when the Bush Administration suggested privatizing Social Security contributions, allowing for investment in the stock market, potentially greater returns, and potentially significant losses. (Oddly, many who are offering this argument against the current healthcare reform legislation are the same people who voted for Medicare Part D, the nearly entirely unfunded Medicare prescription drug benefit.) This group has suggested healthcare reform alternatives that would theoretically lower insurance and healthcare prices, so anyone who wants insurance would be able to afford it. Their ideas include a more open market for insurance, like allowing for the sale of insurance across state lines and increasing competition, and enacting tort reform. They propose that each of these measures would work to reduce costs, making healthcare more affordable. There are a few problems with this reasoning. The first is that it is uncertain that it would reduce prices. Several states have enacted tort reform to limit the amount of punitive damages or pain and suffering damages, but it has not significantly reduced overall healthcare expenses. In fact, Texas enacted tort reform and is one of the most expensive states in the country for healthcare. Additionally, medical malpractice, while expensive, is estimated to account for less than 2% of overall healthcare expense. Selling insurance across states lines may increase competition, but it would also allow insurance companies to sell insurance using the regulations from the state in which they are headquartered, not the states in which they are selling. Therefore, all the insurance companies could relocate to one state with particularly low requirements for health insurance, and sell insurance to people in other states. This is similar to what credit card companies do now, with so many being headquartered in Delaware. Or what many corporations do now, basing their operations, on paper anyway, in another country. That type of competition will likely only provide insurance with fewer benefits. And while insurance companies would compete strongly to cover young, low risk people, they would not do so to cover older, higher risk people, offering no benefit to those who need insurance the most. The next group that opposes healthcare reform are those who think that either our current system works well, or that the alternatives would be worse than our system today. They often use more emotional arguments, including buzz words like socialized medicine, loss of liberty, death panels, and government take over of healthcare; and they often don't know or understand much of how the current system works (or doesn't work), and what is in the currently proposed legislation. While the fear instilled in people who subscribe to this philosophy, and the fear they are working hard to instill in others, is strong, it is unfounded and based on inaccurate information. For example, nothing in the current healthcare reform legislation would include a government takeover of health-care. Doctors would not become government employees, hospitals would not become government owned, and insurance companies would be permitted to remain in business, even for a profit. This group offers nothing to solve the problems of sky-rocketing costs or the high number of uninsured Americans; it only fights to prevent change. In fact, I know several people who subscribe to this theory of healthcare, and most of them will unabashedly say that they don't care that there are millions of uninsured Americans. They say those people should pay for insurance on their own, and the rest of us should not be burdened with higher taxes or insurance rates to fund those who are uninsured. It appears former Massachusetts governor and presidential candidate Mitt Romney falls in this category of healthcare reform opponents. He said today on NPR's Talk of The Nation that the United States already has universal healthcare, citing laws that prohibit hospital emergency rooms from turning down patients based on ability to pay, and therefore poor Americans get free healthcare. What he didn't mention is that the hospitals still bill these patients, but they can't afford to pay, and don't, leading to higher prices for those who can pay and bankruptcy for those who can't. He also failed to mention that hospital emergency rooms are only required to stabilize uninsured patients, not provide long term care, follow-up care, prescription medications, or even surgeries or other life saving procedures. Ironically, Mr. Romney, while governor of Massachusetts, signed into law health-care reform that is in many ways similar to what is being proposed today for the country, and it worked well. Then there the insurance and pharmaceutical companies making billions of dollars every year on the health, or lack thereof, of all Americans. 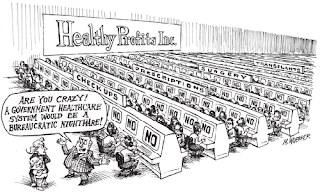 In 2009, the top five health insurance companies made a profit of $12.2 billion; in 2007, the American pharmaceutical industry made $315 billion. A report published by economists Jack Hadley and John Holahan estimate it would cost between $33.9 and $68.7 billion to insure Americans without insurance. That estimate was in 2001 dollars and was published in 2003. Since 2001, the number of uninsured Americans has increased from 41.2 million to 46.6 millions, or about 12%. Taking into account inflation and the increased numbers of uninsured Americans, the cost to provide insurance to those currently uninsured would be between $47 billion and $95.7 billion. The combined profit between the top five health insurance companies and the American pharmaceutical companies was $327 billion dollars. That sure is something to think about. And although it would take, at most, less than 33% of those profits, the big businesses are fighting hard to earn every dollar they can at the expense of the health of Americans. It is clear in part one in this series, Why America Needs Healthcare Reform, why we need to reform our system. Now it is clear why some oppose healthcare reform: for some, it is an ideology, for others it is fear, and yet others it is profit; and all of those factors have come together to create a storm of opposition that for decades has been hard to beat. But the alternative has been worsening, too: a growing population of uninsured, cost increases that are threatening to price more and more Americans out of the market, and comparative results that are unacceptable for the United States among the rest of the world. Part three will provide examples of the health-care systems in other parts of the world and how they compare to the United States. Another great post George, I'm looking forward to reading part three. In addition to the three groups you mention who are in opposition to reform, there seems to be a group of politicians who also oppose it solely for their own political gain. Sad.